What is this tree with needles in big bunches? Hint: It grows only high in the inland mountains at elevations of around 6,000'/2,000m and up. It's our "coolest" tree, subalpine larch, Larix lyallii. It lives at tree line in the Cascades, north of I-90 in Washington and extending just a bit into south-central British Columbia. It generally grows on the eastern side of the Cascade divide. It also grows in the northern Rockies near the continental divide in Idaho, Montana, British Columbia, and Alberta. 1. Like all larches, the grass-green needles grow in big bunches of 20-30 or more, emerging from pegs attached to the twig. 2. When you see subalpine larch, you are in the mountains at or near tree line. You either are chilly or soon will be! Within its range, subalpine larch is the tree that grows in the highest and coldest sites that trees can grow. It edges out its companions, (i) whitebark pine, Pinus albicaulis, (ii) subalpine fir, Abies lasiocarpa, and (iii) mountain hemlock, Tsuga mertensiana (which grows only in sites that get substantial moisture). In many micro-sites, subapline larch grows near whitebark pine, but whitebark pine typically occupies the sunnier side while subalpine larch occupies the shadier and colder side. For example, I just came down from a hike to a ridge that runs east-west, where whitebark pine dominates the south side and subalpine larch dominates the north side. If you're interested, ask me where. • tamarack, Larix laricina, ranging from Alaska across most of Canada and the Great Lakes states and northeastern states to the Atlantic. All larches are unusual among conifers because they are deciduous, meaning that they drop their needles in the fall. They are not "evergreens." This is one way that trees adapt to harsh winter environments. In early October, hikers and photographers love to walk up into subalpine larch country to see the stunning golden trees against the backdrop of high mountains. One added benefit to hiking up to subalpine larch country is that you might see a mountain goat. Mountain goats live everywhere that subalpine larches do. One, within their range, they occupy the coolest / harshest sites. 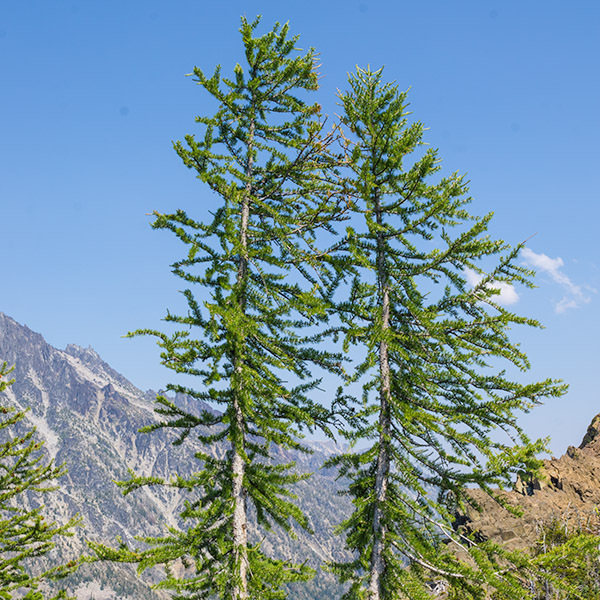 Two, if you are looking at subalpine larches, you are doing alright. You are healthy, you have hiked to a cool spot, and life is good for you! Newer PostWhy does this subalpine fir have no branches on one side?